From Gecco. Black Knight (Kurokishi) is the formidable enemy from the video game Dark Souls consistently challenging players on their journey. The concept of Fire, Ash and Soot, which represents the world of Dark Souls is engraved on the Black Knight's armor, and the intricate and beautiful design are captured by using traditional sculpture techniques. 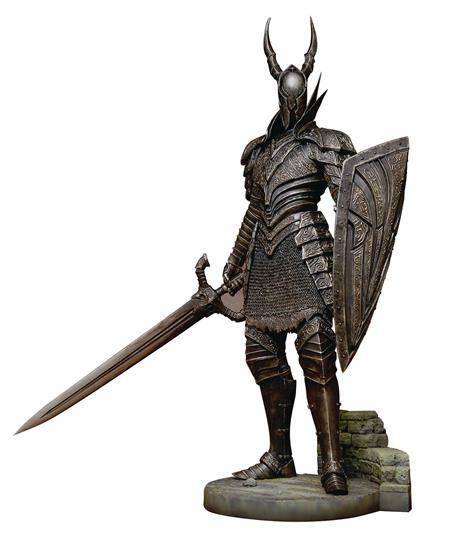 The Black Knight was once the proud Silver Knight of Gwyn and was burnt black. You will see the dull silver in the scorched black surface recreated by the exacting paint work. This statue stands over 16-inch tall, creating an intimidating presence even in 1/6-scale. Moreover, the eyes light up with LED, which further enhances the uncanny character.